A team of Crisis Suits conduct a Deep Strike behind Imperial lines and mow down the Imperial Guard troops that turn to face them. This attack prompted the Imperial commander to call off his attack on the Tau line. “TACTICAL UPDATE: Armored battle suits have conducted an aerial assault behind our lines. Logistical support for our attack on the xeno position has been blocked, and reserves are responding to the threat. Main attack is cancelled until situation stabilized. "—Voxcast to Supreme HQ at 12:00, 03 091 736.M41. The Lemon Russ tank lumbered to a halt, carefully aimed its battle cannon, and, with uncanny accuracy, put a shell through the Hammerhead's turret. An immense explosion followed, and the Hammerhead's turret flew 20 meters into the sky. The xeno armor threat was blunted. At the same time, the supporting Chimera advanced to the wood's edge and bathed the Tau Stealth Suits in holy promethium, while two other guardsman rose out of the top hatch and added their flamers to the attack. The Tau armored suits were annihilated, and the Tau right flank ceased to exist. On the Imperial right flank, the Imperial commander was anxiously waiting word of his outflanking force—consisting of two Scout Sentinels. As his infantry took up position on the wood's edge in preparation for an all-out assault, the lack of contact with his flanking force caused the Imperial commander to order his infantry to stand down and wait orders to continue forward. With the loss of the Hammerhead and Stealth Suit team, the Tau right flank was wiped out—but the ponderous speed of the Lemon Russ tank and the need for Alpha Squad to hold the far-left objective meant that the Tau need not immediately fear a turning of their flank. Still, it was a bitter blow to endure. But all was not lost: Now that it was clear that the high-value objectives were within the Tau deployment zone, the Imperial Guard would have to attack if they wanted to win the day. All the Tau had to do was stymie the Imperial advance to win the battle. To do so, the Tau conducted a successful Deep Strike behind the Imperial Guard column advancing on the Imperial right flank. In the first wave, a team of three Crisis Suits equipped with burst cannons dropped behind the woods and targeted the rear ranks of the attacking guardsmen. The Tau targeted a special weapons squad with three flamers, all of whom were killed. along with a trooper with a lasgun. The remains of the squad, however, stood brave for their Emperor. Meanwhile, the fire warriors on the front line opened fire on the Imperial Guard deployed on the wood's edge. Joining this fire were the piranha squadron and its supporting drones, which crossed the ridge and advanced on the woods. An immense volley of fire killed seven guardsmen, although the brave troops also stood their ground. Nearby, a Devilfish—transporting a reserve unit of fire warriors—eased up on the ridge in anticipation of being ordered forward when needed. Outflanked by the xeno Deep Strike, the Imperial commander opted for caution over boldness. Calling off the infantry attack on the Tau objectives, he ordered his men to turn on the Crisis Suit team, and the men dutifully reversed course to return to their initial launching point and deal with the threat to their rear. Troops close enough to the wood's edge took advantage of the short range to fire multiple volleys into the Crisis Suits and managed to penetrate the armor of one suit and bring it down—and to wound a second suit. The mortar team, a likely prize target of the Tau, fired a barrage at the Crisis Suits, despite the risk of a stray round striking their own comrades in the woods. The fire went wide. On the far flank, the Lemon Russ tank, a lumbering behemoth of a vehicle, had no chance of maneuvering in time to affect the battle. But it had a long-range weapon, and it used it, targeting a squad of Kroot in the woods but missing. The Chimera turned right and advanced on the Tau in the center of the field, dousing two drones with a heavy flamer and sending the survivors scurrying back for cover. To the horror of the Tau, the Imperial flanking attack finally arrived, with two Scout Sentinels, armed with auto cannon, arriving behind the Devilfish waiting in reserve. The Sentinels fired upon the rear armor of the skimmer, destroying it and forcing its enclosed troops to evacuate and face the armored walkers. In the center, the firepower of the Lemon Russ tank and Chimera was too daunting to confront. The fire warriors quickly withdrew, giving the Imperial Guard momentum as they sought to clear the center of the Tau line. With the Imperial attack apparently called off, the piranha broke off their attack and roared "flat out" toward the center of the battlefield to shore up the defenses. On the Imperial right flank, the appearance of the Sentinels caused consternation in the Tau ranks. The fire warriors who had hastily disembarked from the destroyed Devilfish turned their weapons upon the walkers and damaged one. Meanwhile, the line of drones also abandoned their attack on the woods and turned back to defend the Tau lines. Behind Imperial lines, a second team of Crisis Suits landed. One of those who landed was Commander Swiftstrike, and although his team were armed with anti-armor fusion blasters, they were not entirely useless against infantry. While the weapon's rate of fire was low, any guardsmen struck was vaporized. The five Crisis Suits now on the table opened fire on the troops in the woods and killed five guardsmen in two squads. Despite this horrific fire, both squads stood their ground. Nothing seemed capable of breaking the Imperial Guard's morale. The Lemon Russ fired at a piranha and destroyed it. The Chimera, trusting the tank to deal with the xeno skimmers, took advantage of the fact that a heavy flamer and flamer pay no heed to terrain, and the vehicle's two weapons bathed the woods with promethium, killing four Kroot. At this point, the Imperial commander realized there were only two things he could do to salvage the battle. He needed to drive off the Tau threat to the objectives in his deployment zone—and trust that the Sentinels could at least contest a high-value objective on the Tau's side of the table (and also gain a victory point for being in the enemy deployment zone). So every guardsman that could pointed his lasgun at the Crisis Suits. The gunfire was almost useless against the advanced technology of the xeno armor, and the volley against the Crisis Suits nearest the woods proved ineffective. With greater luck, however, the fire of the lascannon and lasguns of the platoon command squad was more productive: the Crisis Suit team of Commander Swiftstrike took several hits, with a lasgun shot crumbling the xeno commander's armor and sending him senseless to the ground. With the Devilfish out of action, the Sentinels next turned their attention to the fire warriors that had hastily disembarked from the skimmer. Five fire warriors were killed, while the rest began running for the table's edge. In the center, the Chimera's torrent of promethium had set the woods afire, and the Kroot slinked away, leaving their dead to the flames. The surviving Piranhas avenged their lost comrade by targeting the Chimera's flank and destroying the transport, its veteran troops forced to disembark or face a fiery death themselves. Commander Swiftstrike scanned the battlefield and determined that his Crisis Suits would lose any contest of firepower with the growing body of Imperial troops deploying out of the woods. He sent the burst cannon-equipped Crisis suits into melee with the human infantry to limit the threat of lasgun fire, while he and his team advanced on the Imperial-held objective in the corner of the battlefield. In the melee, the Imperial overwatch fire was useless, but in the close-in fighting, even the advanced armor of the Tau was no match for the sheer number of warriors that joined the fight. Both Tau suits were dragged to the ground by a frenzied mob of soldiers. Behind Tau lines, the fire warriors from the Devilfish fled toward the edge of the battlefield, while the Drones targeted the Sentinels, damaging one with fire and taking the previously damaged walker out of action. The battle was coming to a close, and the Imperium was forced to hope for the best. The veteran squad in the battlefield's center advanced toward the Tau position but knew they were too late. In the woods, with the first team of Crisis Suits destroyed, the Imperial Guard targeted the two remaining Crisis Suits but failed to slow them down. 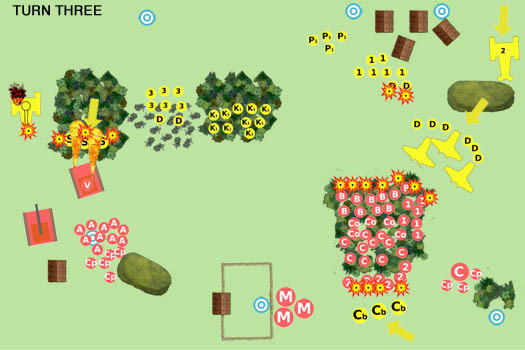 The game would be decided in the Tau deployment zone. With one Sentinel lost, all that the surviving walker could do was seek to deny the Tau their two high-value objectives. 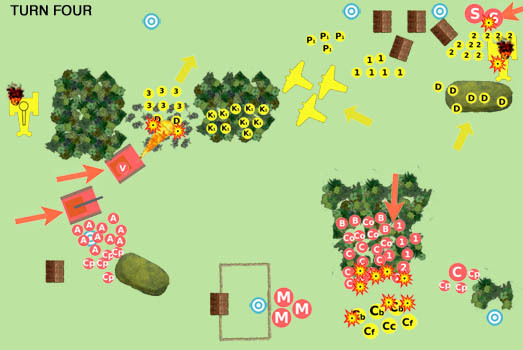 The Sentinel advanced to seize and/or contest one objective and targeted the Pathfinders that held the second objective a short distance away. One casualty to the small Pathfinder squad would cause a morale check and cause the Pathfinders to flee the table, but the walker's auto cannon failed to find its mark. The battle was essentially over, but the Tau were not ready to concede anything to the Imperial forces. On the Imperial side of the table, the two Crisis suits seized the objective on the Imperial right flank, while calling for an extraction of their wounded commander. Seizing that objective garnered 2 v.p. for the objective, plus 1 v.p. for being in the Imperial deployment zone. 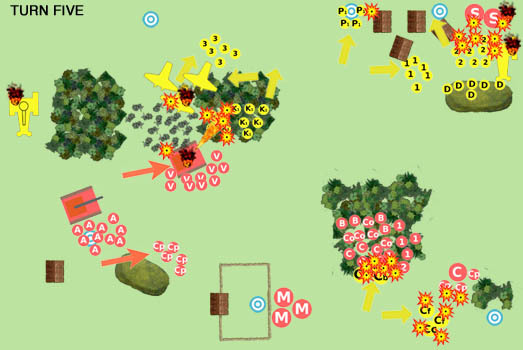 The most crucial battle, however, centered around the objective seized by the surviving Sentinel. The Tau 2nd Squad rallied just before it left the battlefield, allowing it to contest the objective, but the Tau weren't satisfied. Every xeno unit possible opened fire, and volley after volley struck the Imperial walker. Eventually, a shot managed to find a weak spot in the walker's armor and bring it down. The objective—the most valuable on the battlefield, as it turned out—was back in Tau hands. Tau: 3 objectives worth a total of 9 v.p., plus Linebreaker worth 1 v.p. Total of 10 v.p. Imperial Guard: 2 objectives worth 4 v.p., First Blood worth 1 v.p., and Kill the Warlord worth 1 v.p. Total of 6 v.p. TheGM: What can I say? The random placement of objectives greatly favored the Tau, but by the end of Turn Two, I was in a great position to win the game—until I allowed myself to panic at the sight of Tau Crisis Suits dropping behind my lines. I should never have turned around to face the Tau threat to my rear. I should have pushed hard for the Tau side of the table and seized those objectives. Attacking in conjunction with my Sentinels, I had a good chance of overwhelming the Tau position. The Crisis Suits would have given chase, but I'd have held the initiative. Instead, I squandered my tactical advantage to little avail. For the Tau commander, the loss of the Crisis Suits was a fair exchange for keeping the bulk of my army away from the Tau position. I should have seen that. The Tau commander recognized the game was about objectives, and he scared me into fighting for low-value objectives. He deserved the win. This battle is "semi official." My logic is that a long-absent club member joined me for a casual game one Sunday, and as he hadn't played 40K in years, I didn't want the game to sway the Dar Sai campaign too much. More regular club members should sway the war. But I wanted our game to be a part of the history of the Corvus Cluster. So I decided we'd fight on a "secondary front," a minor military foray that--perhaps in the future--could make a difference. If my friend decides to invest in this "front," we may give his part of the war a more substantial role. Oh, by the way, Commander Swiftstrike survived the battle. Although commanders can die (anyone recall Captain Stompafist or the Tau's Kor'el Dal'ta'ai? ), Swiftstrike was successfully evacuated as the Imperial defenses collapsed and retreated. 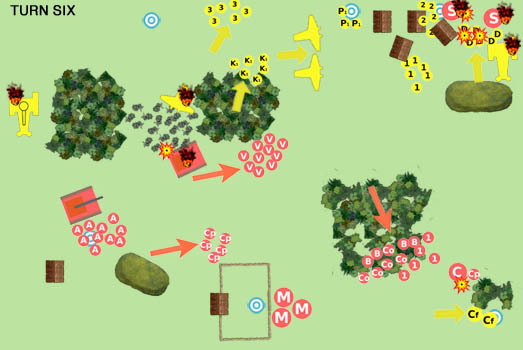 Click here to return to the beginning of the battle. The Corvus Cluster is a hobby blog that documents our adventures in the fantastical, sci-fi Warhammer 40K universe of Games Workshop.